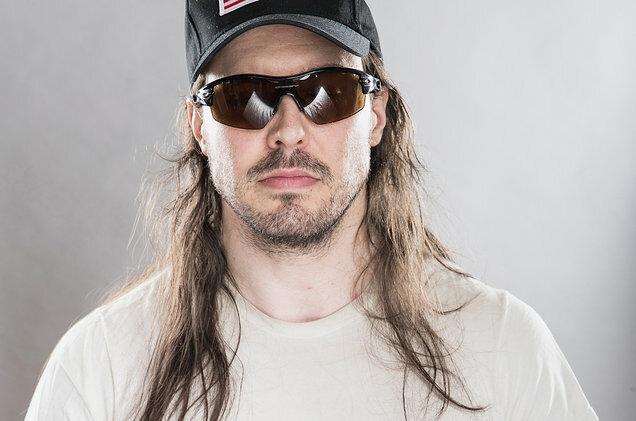 Andrew W.K is a man who wears many hats. He is a musician, a columnist, he once had his own television show as well as at one point considering starting a political party. Most people will know him as the white-clad man who loves to party and who plays a pizza guitar. We were able to catch up with him at Download Festival and talk to him about his music, how he is still accomplishing new things so far into his career, his aspirations and relationship with his fans, and also about opening up to the world about his own personal struggles, You may think you know who Andrew W.K is, but there is so much more to him than you may think. Welcome back to the UK. It wasn’t that long ago since we last saw you, as you recently wrapped up a tour in April. How does it feel to be back so soon. Andrew: It’s interesting because we have been in some of the same exact places in terms of parking lots and some of the infrastructures of the tour is the exact the same, so it’s almost been as if I never stopped., so it’s kind of like a deja vu quality in the best way. Andrew: I think they’ve been liking it. I always feel like it’s best to ask them because I would never want to speak on their behalf, but I hope they like it, that’s all I can say. I think if the shows have been going well for you, that gives you an indication as an artist that fans are having a good time. Andrew: I wouldn’t even know how to judge if they’ve been going well. I can say that we are happy to be having the opportunity to play, we played our first shows in Poland, we’ve never played there in 18 years together as a band, so that was very satisfying to finally go there and meet some of the folks that invited us to play and amazingly wanted to see us, so we’re just thankful. We got to play some festivals in Germany, that was also a really big deal for us and we’re just trying to build it up. You mentioned getting to play places that you hadn’t played before and still getting to do new things this far into your career. How does that feel for you to still be discovering new places and doing new things with this band. Andrew: On one hand it’s quite frustrating and humiliating to think that it took us that long to go there, but on the other hand it’s the exact opposite feeling, it’s a huge dream come true that finally, things are beginning for us. It’s an odd feeling, on one hand, to feel like you’re just starting after 18 years, but on the other hand, it feels like we’re at the end of something as well. There are a lot of polar opposites, a lot of polarities for me in this work in general with some of the greatest feelings and I wouldn’t say the worst feelings, but definitely challenging feelings. With a show like Download, how does that affect the way you write the set. Do you try to stick to the more popular songs that people know or do you try to make it a bit more varied. This isn’t your first time playing Download, you have played here once before. What is it about this festival that makes it so special for you and what things did you take away from the last performance that will prepare you for this one. Andrew: We were very lucky last time and I believe also today to be in the tent stage, and the great thing about the tent stage is that if you are playing in daytime like we are today, we still get to have some atmosphere and lights and for me that is a really special bonus at a festival, often times we’ll be playing outside and we’ll still have lights and they won’t really show up because it’s too bright outside so I really like the added drama and the tension that the tent encloses in it, so that has a different dynamic to the endless open air field feeling, we asked to play that type of stage again and I was really thankful that they allowed us to. I know that there were some legal issues involving some red tape so to speak that held up the release of You’re Not Alone. So are you relieved to finally have the album out and be bringing new music to people. Andrew: Definitely thankful, and I feel very fortunate, but each one of those positive emotions or positive feelings is counteracted with a negative one, so I also feel quite dismayed and afraid and also frustrated, but that frustration if you can get in front of it and use it as a motivating force it’s quite propulsive, so I think in a way the band I have more drive and determination than ever, and a lot of that is based in anger, for me at least and fear, but those can be very powerful if you are able to use them as fuel. A lot of the time because the reactions that I feel are so contradictory I don’t really feel anything or have a feeling that I settle on, do I feel great about things?…no, do I feel bad about things?…no, I’m just existing and I try to approach each thing as a task at hand, like today is all I’m really thinking about and trying to make the most of this opportunity to play Download again, and that will still exist today because we might not tomorrow, and this could have stopped a long time ago and that’s not lost on us either, I just want to do the best that we can and I don’t really have an opinion on it other than that. You are a man who always seems to have something going on. Whether you are on tour, writing your column answering people’s question or when you had your television series, you always seem so busy. I have to ask where do you find all of your time. Andrew: To me, I don’t feel very busy at all. Often I’ve felt quite disappointed with myself for not doing more, I think if someone such as yourself followed along with me on an average day or over the course of a few weeks or months you would see that there’s not that much going on and that there could be a lot more done, and that’s another thing that I;ve felt quite conflicted about, a sense of laziness and bad decision-making and all kinds of things, but there’s nothing I can do about that, that’s already happened so again, I just try to do the best I can today, and learn from all the mistakes and all the lessons and that’s the only thing you can take away from a bad experience sometimes is some further insight that helps guide you towards a better future. During your time writing your column you were being very open with the people you were writing to and you were connecting with your fans and the people who listen to your music. Was that a strange experience for you or did it turn out to be quite rewarding. Andrew: I would say it was strange in that I felt like it was a very bad idea to do at the time, for me to talk about that stuff, but despite those misgivings that I had, there was a deeper instinct that I should do it, and to this day I don’t know if I feel good or bad about it, I think it’s too painful, not the topics themselves, this doubt and this constant second guessing that if I go down this road, but then again there’s nothing I can do to change the past, so sometimes I think I shouldn’t talk about anything ever, but then there are times when I think I should talk about everything as much as I can, and again I don’t know if I have a particular game plan that I use day in and day out other than trying to follow my instinct as they rise up and make the most of it, sometimes I think those are the best things I’ve done and other days I think it was the stupidest stuff I’ve done, I don’t know, it’s a weird thing to not really have an opinion about what you’ve done, but it can be very crushing to examine one’s life or work and make a judgment about it, all I know is that I’m here now and I’m thankful to be here now, so there must have been something good in it, so that I can try to make the most of this day-to-day and going forward. Andrew: I’ve seen a lot of people doing it, and I suppose in a way that’s what inspired me to be more open, not specifically people in music or tv, but certain sports people like Terry Bradshaw who I never would have imagined would talk about anything personally. There is a reason people don’t talk about personally, but maybe it’s not that interesting. I’m glad, even if it was just you who was made to feel something useful out of that, then that’s good. I don’t need to say any more, but thank you for saying that. You are currently booked up tour dates all the way through until September what will be the plan for you when you are done with the tour. Will you be taking a break or will you start to write a new album. Andrew: I’m always thinking of things, like last night I was thinking of cord changes and things like that, it happens from time to time, but I’ve never really been able to formally record while on tour, I’ve always admired people who were able to do that, I always was only able to ever do one thing at a time, I never realised that until recently so yes, after this I would like to begin working on the next album so it doesn’t take so long, and I just to pray that the party gods enable a smooth release plan this time and that I can learn from all the past errors, but other than that just take things as they come as much as possible, it’s a very bewildering but joyous time. As an artist with a near 20-year career behind them, what would you say is the most valuable thing you have learnt in that time. Andrew: To trust your instincts, I think that is probably the best lesson, I’ve learned that the easy way, the great way and the really brutal way but that’s all you’ve got really, that’s all you’ve got inside and to be able to faith in that is quite challenging because it’s quite an elusive feeling, it’s not going to explain to you why you are going to do a certain thing or why you have this compulsion, you won’t even necessarily understand it and that’s why it’s so challenging because our mind has to have a very clear of why this is the right thing to do and why this is the wrong thing to do and you don’t always get that clarity along with that instinct. the instinct will just be a strong undeniable feeling and you just hope that you have the courage to follow it, as Morgan Freeman’s character in Evan Almighty said ‘You pray for clarity, you pray for courage and you pray for direction, but you don’t usually get that, you get the opportunity to act upon it’ and that;s what I hope, that we have the opportunity to continue to do this, that;s the thing we pray for most of all and so far we’ve gotten it, and that’s the thing we don’t take it for granted for sure and the whole band is very thankful and very aware of how lucky we are to have gotten to do any of this at all and to continue to do it in some capacity all these years later. In closing do you have any final thoughts that you would like to leave us with. Andrew: Whether you are someone who is just coming to the party now or you are someone who has been with us for a matter of years or all the way back to the beginning, I want to say thank you very much for finding something useful or valuable or meaningful or even finding anything in this that contributes good or some kind of strong feeling to you or your life and let’s just keep it going.